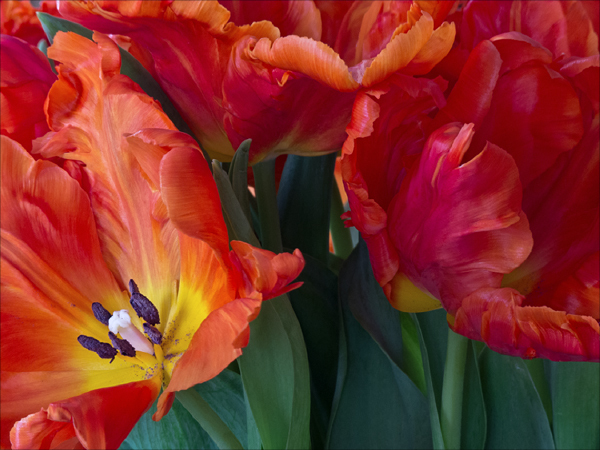 Hungry for color, I broke down and bought a bunch of tulips the other day. These were photographed with my Panasonic Lumix (on a tripod), because I originally envisioned a square format—though I ended up with a 4:3 composition instead. The ability to choose different aspect ratios in-camera is my favorite feature of the Lumix. What really delighted me, however, was how beautifully the Lumix captured reds—normally so difficult to hold on my Nikon D300! This image required very little post-processing. I did use a circular polarizer for this frame, but that was primarily to reduce glare on the waxy petals. Color was equally good on previous frames without the polarizer. Ah, flower pictures with a tactile quality. This scene makes me reach out and want to touch, caress, feel instead of “only” look. I like that a lot. To engage the viewer’s senses instead of their intellect—that I count as a successful image! Thank you for your comment, Roland.